Easter 2014 fell in the midst of a busy season for both Alex and me (finals for Alex, final paper for me). 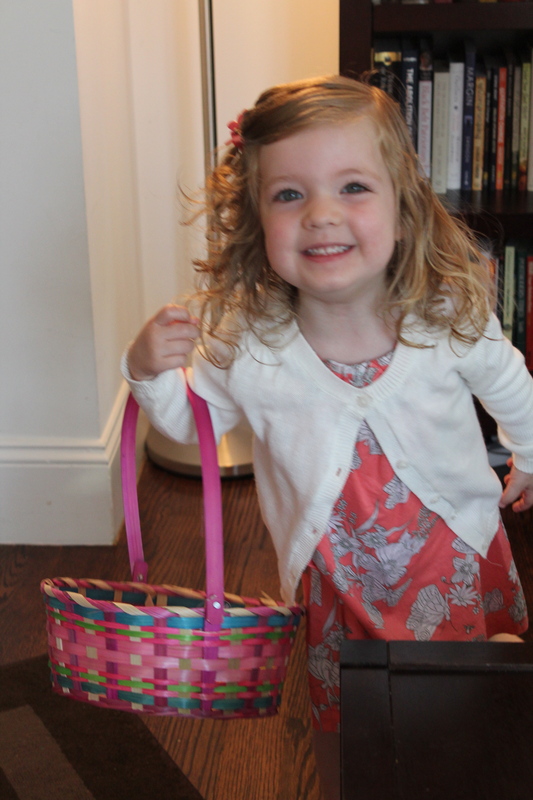 In the morning we attended church, and after naptime did Resurrection Eggs and an Easter egg hunt. 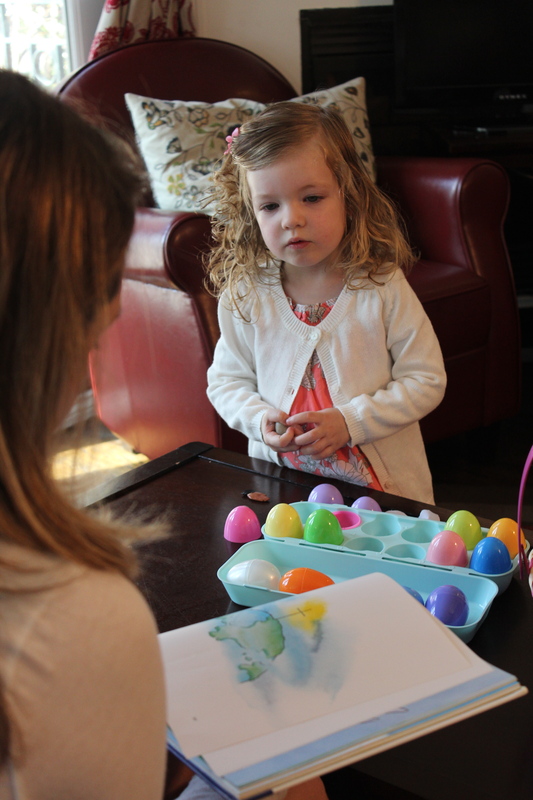 Audrey and I had been reading the Easter story in her “Big Picture Story Bible” leading up to Easter, so we opened the Resurrection Eggs and related the objects inside to the story. 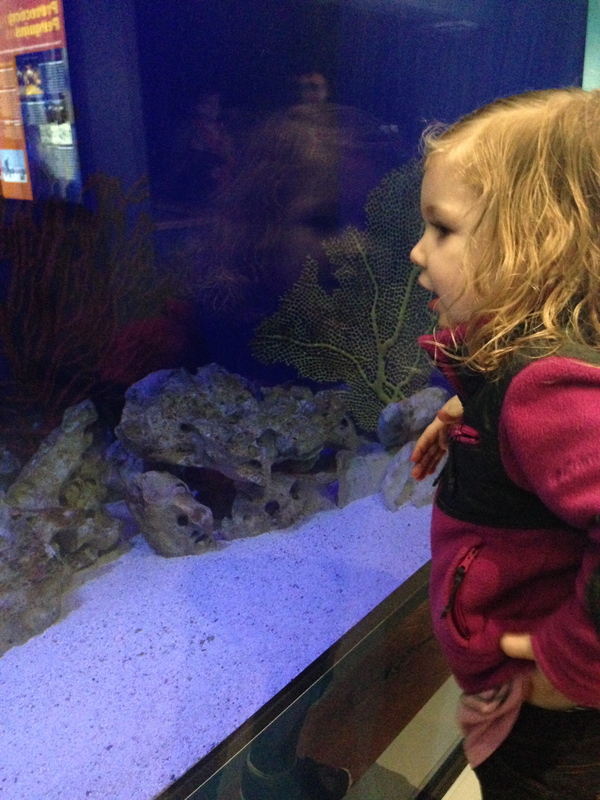 She was mesmerized. 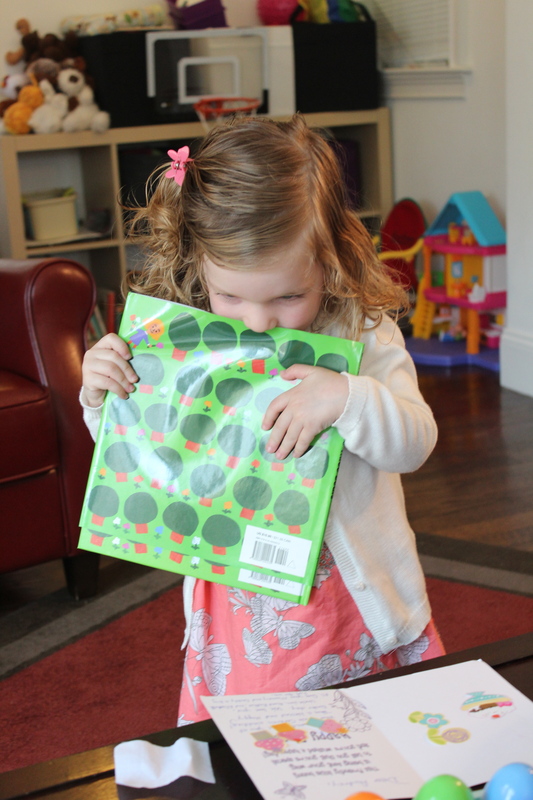 She also discovered books in hear Easter basket from Mommy and Daddy and Nonna and Poppa! 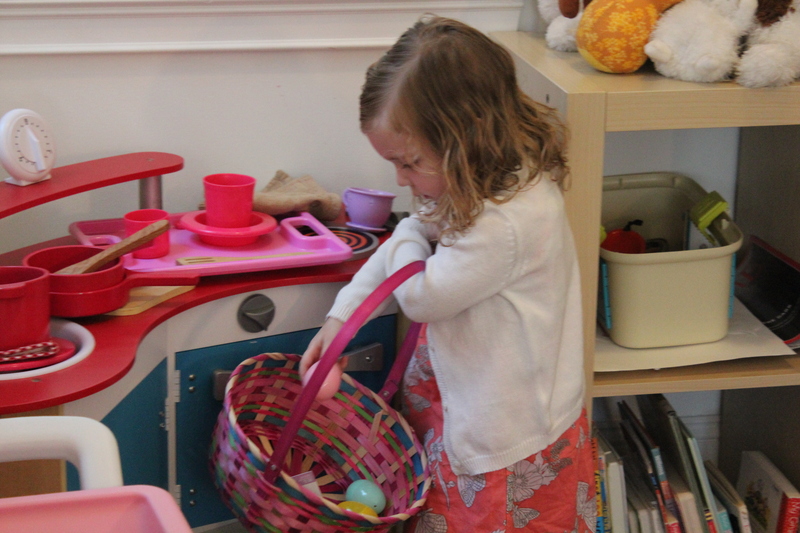 Then, it was time to hunt for eggs! Audrey wasn’t too interested in the cheddar bunnies I put inside her eggs, but she loved opening an empty one, running up to me and excitedly telling me “It’s empty because Jesus died on the cross for our sins and rose again!” I know she doesn’t know the meaning of these truths yet, but we pray they sink into her little heart as she grows older. I think I will forever be on a quest for the “perfect” routine or schedule. I have finally come to the conclusion that I’ll probably never arrive. That being said, here is a glimpse into our days. This may not be interesting to any of you, but I wanted to have it for me for the days to come! 7:00am: On a good morning, Audrey wakes up about now. 7:30am: Alex or I get Audrey up for the day. The girl looooves her bed and is usually in no hurry to get out. She loves it when we just sit in the chair and talk with her for a bit before getting her dressed. 7:45-8:30am: I try to work on a few projects while Audrey is usually content to play by herself. 8:30am: Breakfast. Toast and yogurt for both of us. (And prunes for Audrey. And more coffee for me.) Audrey takes a looong time to eat, so I unload and load the dishwasher while she eats. 9:15am: Bible and Book Time. We sit down on the couch to read a Bible story, do our memory verse, and pray together before reading a big stack of books. When we’re done, I have Audrey “practice sitting still” on the couch for 2-5 minutes. 10:15am: We’re ready to head out, or, stay at home and get projects done. Going out can include errands, a play date, or a trip to the library and park. 12pm: Home for lunch. Audrey always has a cheese quesadilla and a cup of milk to finish it off. 12:50pm: I take Audrey back for her nap. We put on her jammy pants, do lotion, and get her zipped into her sleep sack. 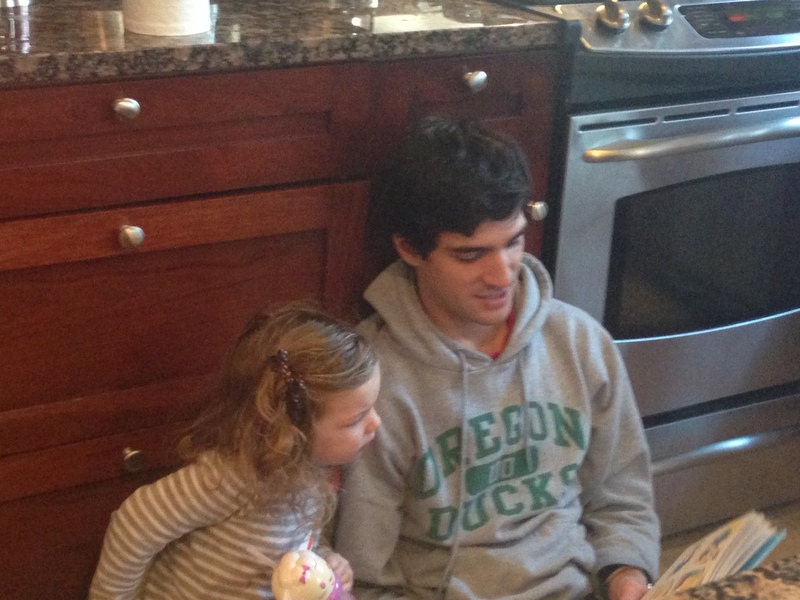 Then we sit in the chair while I tell her a pretend story (often about Curious George going to the grocery store!) and we pray. I turn on her white noise, sing “Twinkle Twinkle Little Star”, and lay her down in her crib with a few pats on the back before telling her “good night, I love you!” She usually falls asleep by 1:20pm. 1pm: Mommy’s downtime. I have some computer time then work on writing or reading for my Yalta class. 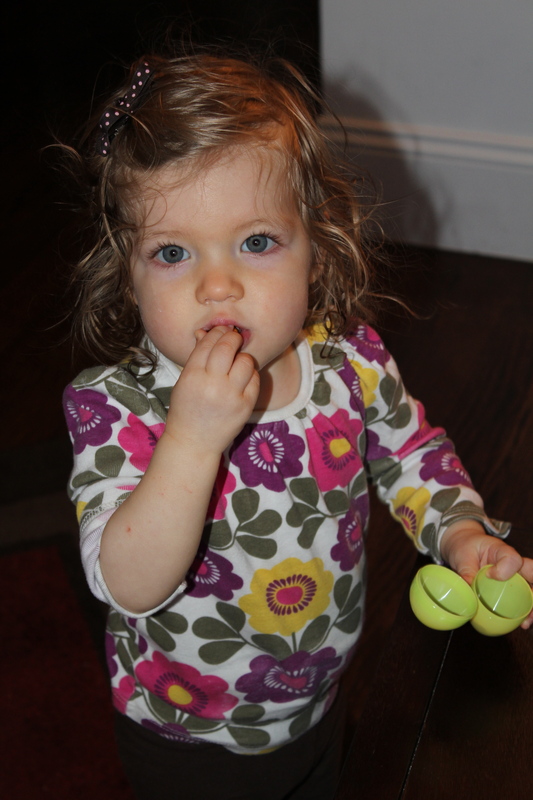 3:15pm: Get Audrey (reluctantly) up from her nap. She is usually content to hang out and sings or talks to herself for a while before waking up. She naps about 1.5-2 hours these days. 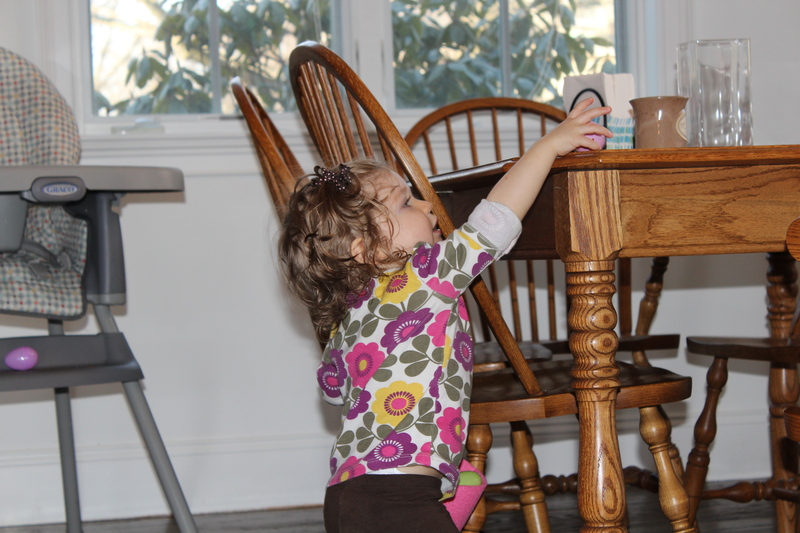 3:30pm: Small projects around the house while Audrey plays. 4pm: This really varies. Sometimes we Skype with Mom (yay!). Other days we go to the park. If it is rainy and I’m feeling energetic, we might break out “crafts” and make flowers or butterflies out of construction paper. 5:15pm: I start dinner. Audrey sometimes does “blanket time” (playing on her blanket with toys and/or books) for 15 minutes so I can focus on meal prep. 6pm: Alex gets home! We sit down to eat right away. 6:30pm: One of us starts the dishes. 6:45pm: Daddy and Audrey’s play time. Mommy’s rest or work time. 7:30pm: Alex starts Audrey’s bedtime routine. She drinks her milk on the couch, then is in the tub, then gets jammies and a story and song with daddy. She comes and knocks on the bedroom door to tell me good night. 8pm: Relax time for Alex and me before we call it a day and get ready to do it all over again! What are the best parts of your routine or schedule? We always love ideas!! I want to start a new, occasional series: flashback Fridays! The idea is to take the chance to record some family memories from before I was blogging. Hopefully you’ll enjoy following along! 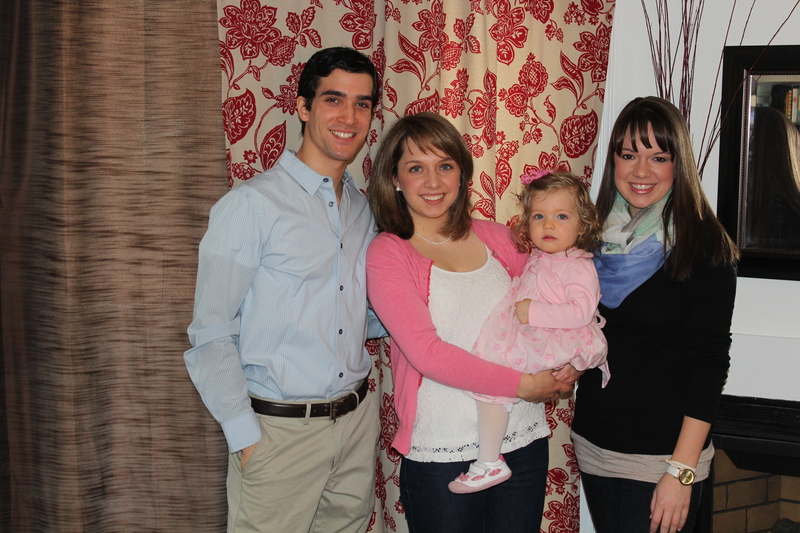 Easter 2013 fell on March 31 and the two highlights were Tiffany coming to visit (yay Seester Easter!) 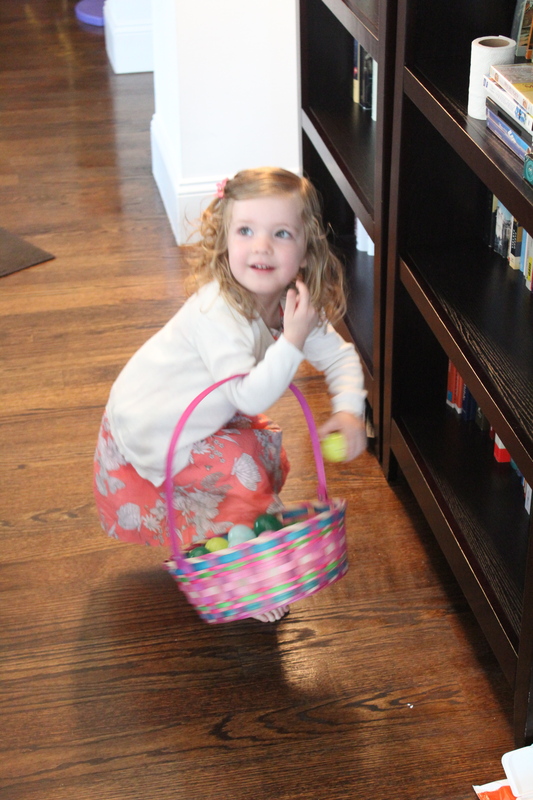 and Audrey’s first Easter egg hunt! 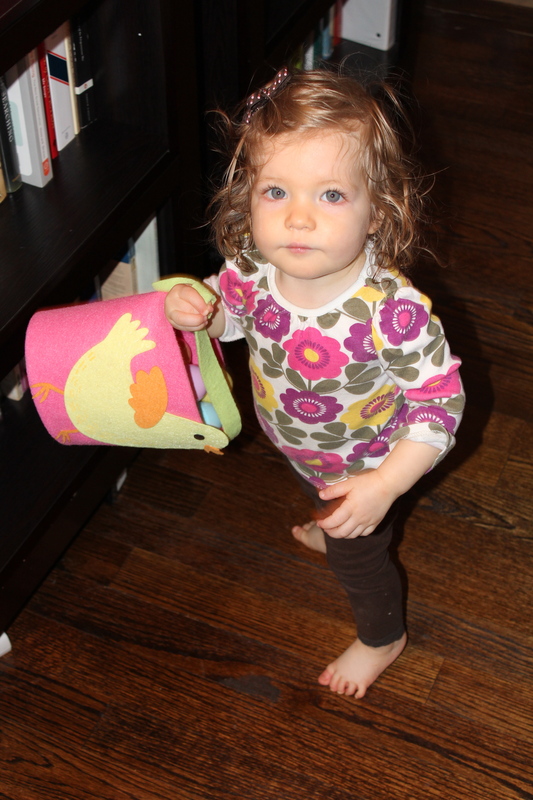 If I recall correctly, it was a chilly day and we really don’t have the space to do an egg hunt outside, so we hid them around the house after her nap time. 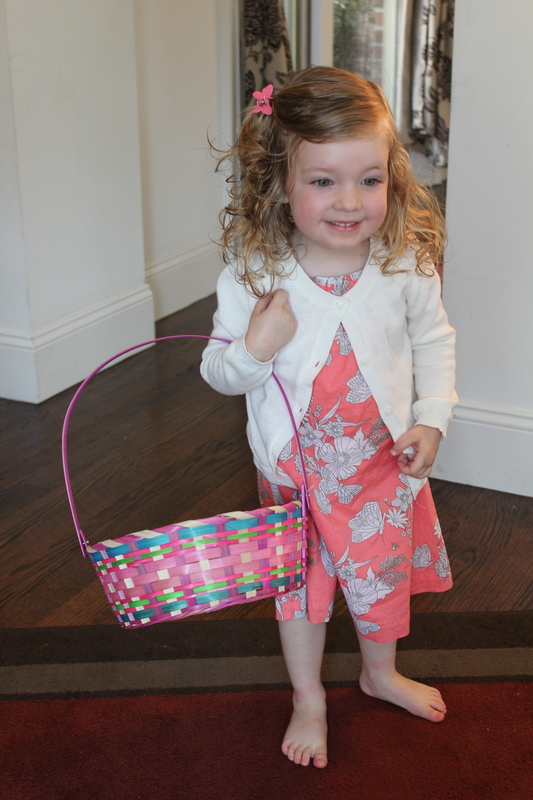 I had filled the eggs with Easter-colored goldfish crackers and she had a blast finding the eggs and eating what was inside! 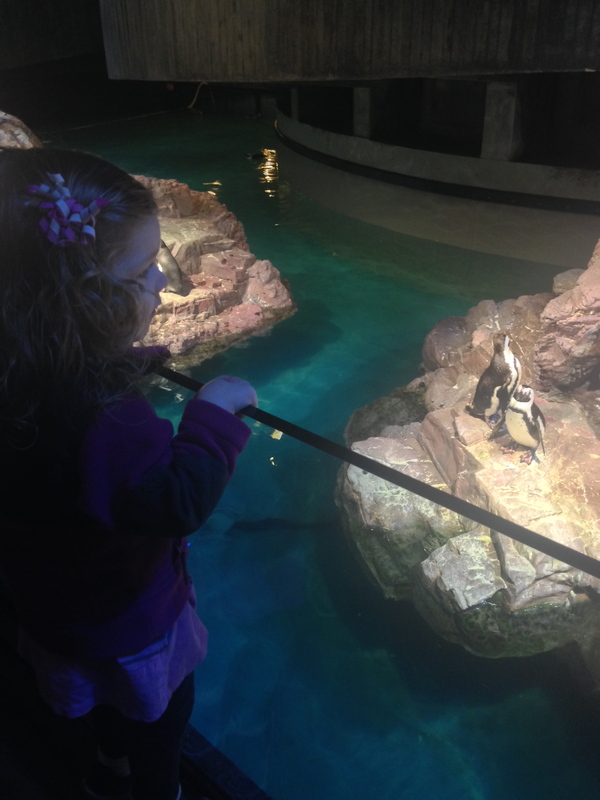 We had a great time with Tiffany despite a less-than-ideal Easter dinner. For some reason, I decided not to cook and to instead just do our regular Chipotle stop. Well, Chipotle was closed and our Qdoba experience was poor and Audrey was fussy. Not the best Easter dinner. We did snap a few family photos before church, though. They turned out a bit better than the dinner, fortunately. 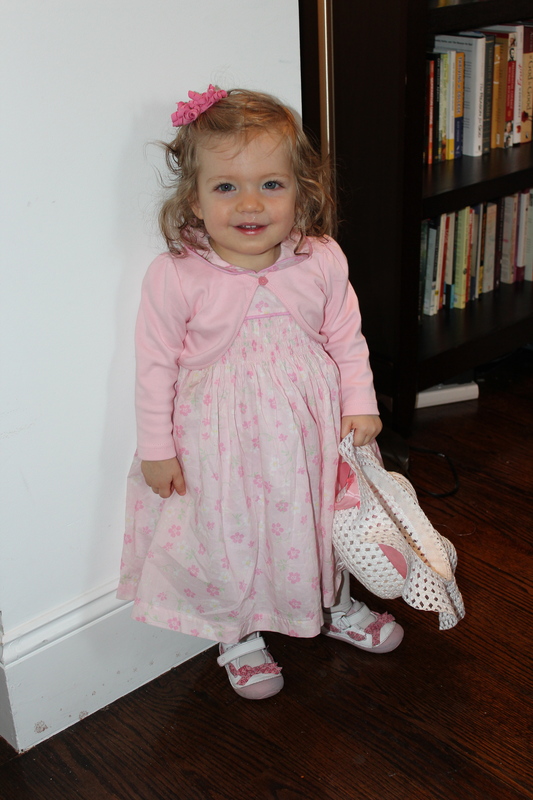 My little girl in her first grown-up Easter dress (and a hat, which she still plays with, too!). 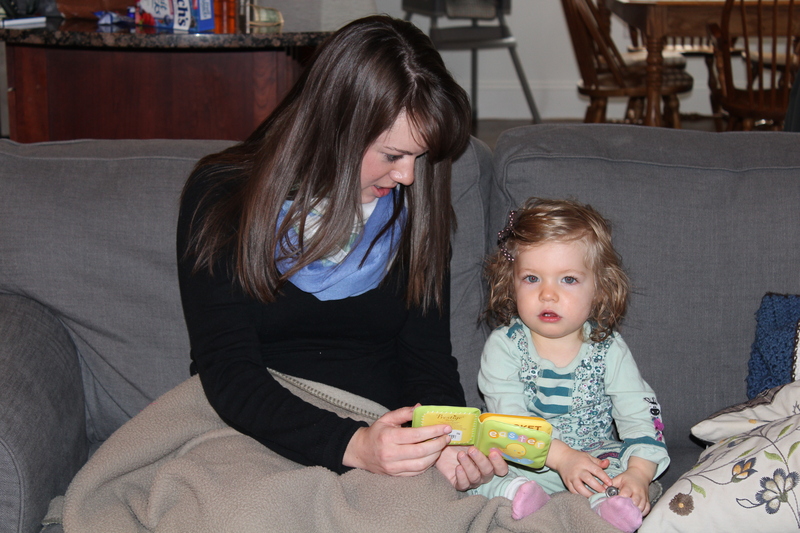 Tiffany and Audrey wrapped up the day by reading Audrey’s new Easter book on the couch. 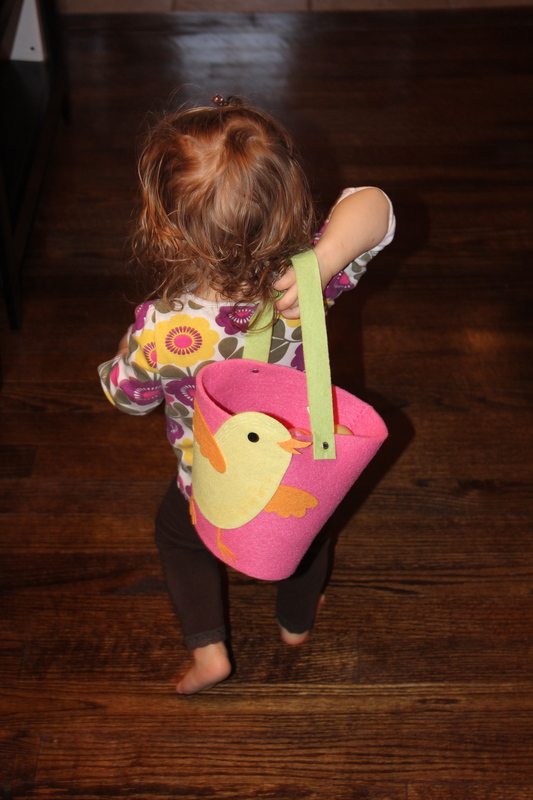 Since Easter is quickly approaching, how do you celebrate or prepare for Easter? As many of you know, my mother-in-law, Sono, passed away from cancer almost four years ago. 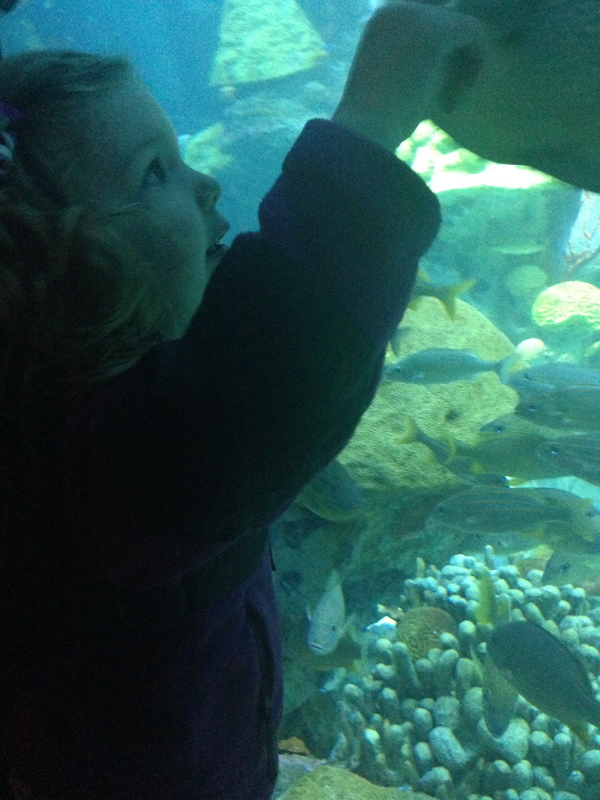 It was just about this time in 2010–right after Alex and I were married– that we first learned she was seriously ill. It was a precious gift, for my husband but also for me, to remember all those family happenings and to know they would not be forgotten. For while we would normally never think of them on a daily basis, each of them had a role in shaping the people we are today. They are worth remembering. The spreadsheet was a perfect example of why I wanted to start “So We Remember.” I am not good at tracking family memories. Audrey doesn’t have a baby book (which I deeply regret). We don’t have family photo albums–yet. 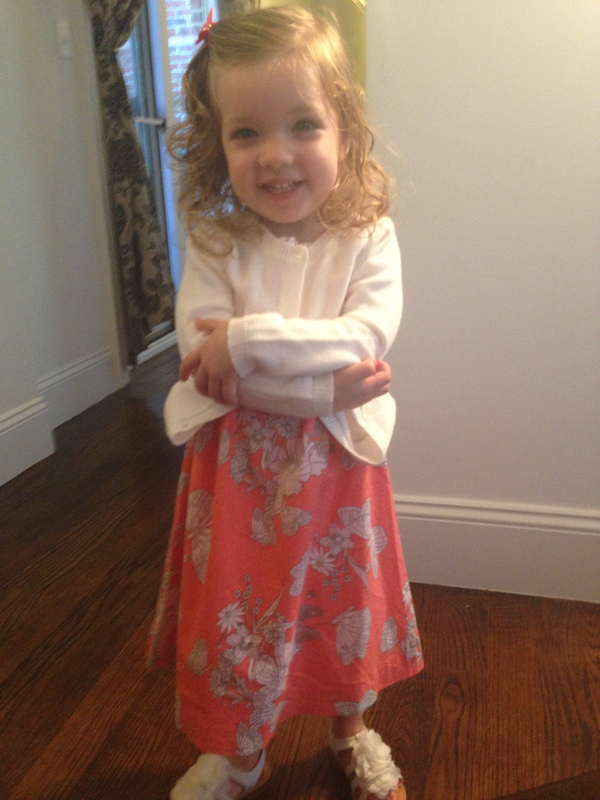 But I don’t want to forget what she looked like and said when she was 27 months old. I don’t want to forget the rhythm of our days in Alex’s second year of law school. I don’t want to forget what I was thinking as a young mom. Because these days are shaping who we are, and they are precious gifts that are worth remembering…. so, we remember. Audrey and I have taken more flights together than I can count. 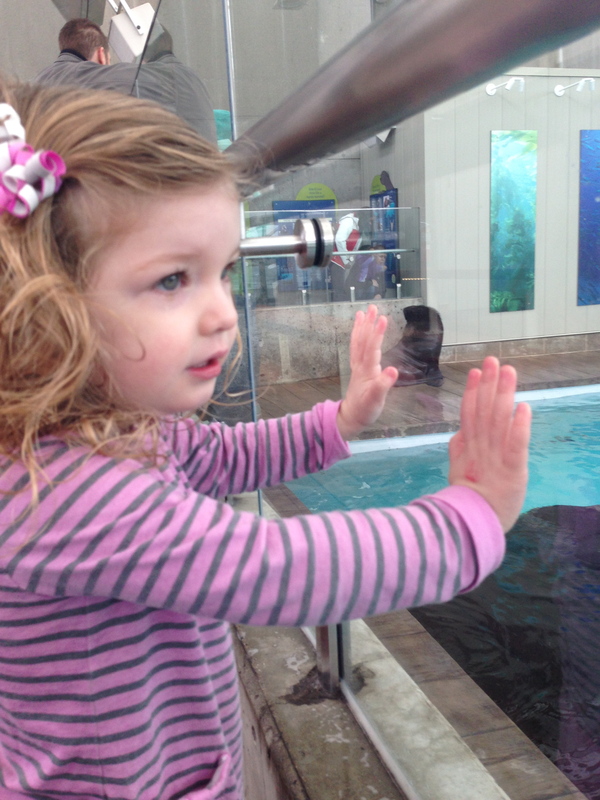 Sometimes Alex has been able to accompany us, but often it is just Audrey and me. Our longest adventure so far was the 5-6 hour flights between Boston and Seattle. Whew! I thought I’d record what works for us. Maybe it will be helpful to you. And one day I know I’ll look back on all these details and smile. -Diaper, extra shirt and pants in a large ziplock bag. It is handy to stick wet clothes in here if needed. -Lots of stickers and construction paper. This set is neat if you have an older child but regular stickers are just as good. We made a card for Daddy on our last flight. –Imagine Ink marker and pad. $3 in the dollar bins at Target! -iPad loaded with plenty of Curious George episodes and these awesome headphones. -Lots of nut-free snacks and a cup for water. (Applesauce pouches and Annie’s cheddar bunnies are favorites). -Anti-bacterial wipes: great for wiping hands and wiping down the tray table and windows for any peanut residue. I bring our umbrella stroller and pack everything into two bags: a bag I can ‘wear’ and a small bag with food that can be hung on the stroller. We also carry on Audrey’s Cosco Scenera carseat. 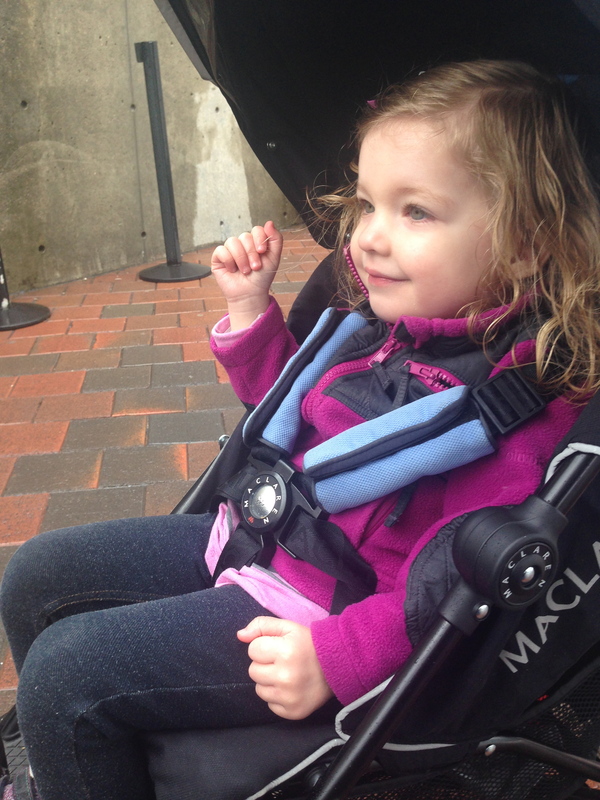 It is super lightweight and hangs easily off of the umbrella stroller for getting through the airport. Since she knows that she has to “stay put” when she’s buckled into a carseat, we don’t have to struggle to keep her in her seat. We’ve found it helpful to get to the gate (after visiting the bathroom for a fresh before takeoff diaper!) about 15 minutes before boarding. This allows time for Audrey to run around and get out some wiggles after being confined to the stroller going through check-in and security. We also try to just board with our regular group to cut down on having to sit longer on the plane! Once on the plane, we’ll look out the window, talk about what we see and usually read some books during takeoff. After take off, if it is a longer flight I alternate letting her watch 2-3 episodes of a show with playing games, going for a walk down the aisle, and having a snack. This has helped things go super smoothly! As I look over these notes, I can’t help but be grateful for the chance to travel with my little girl to see the people we love most. 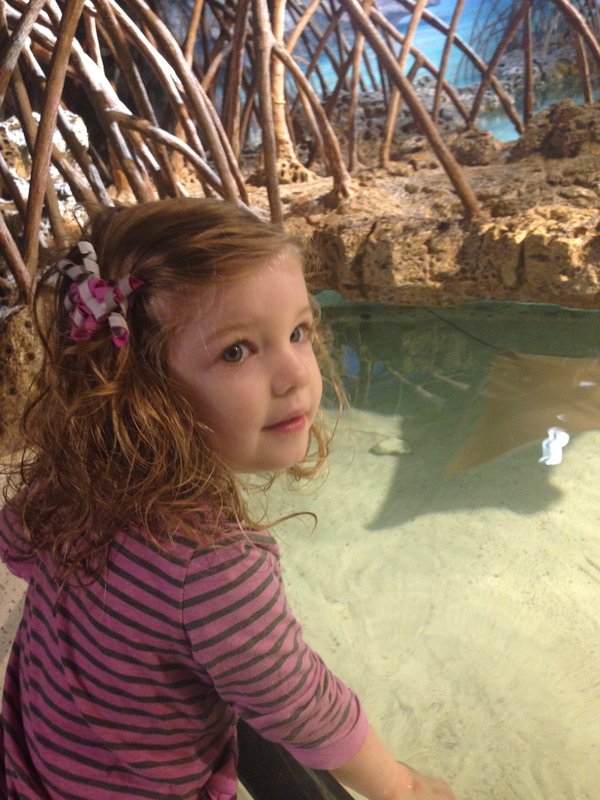 If your a parent who travels with your littles, what are your favorite tips and tricks? 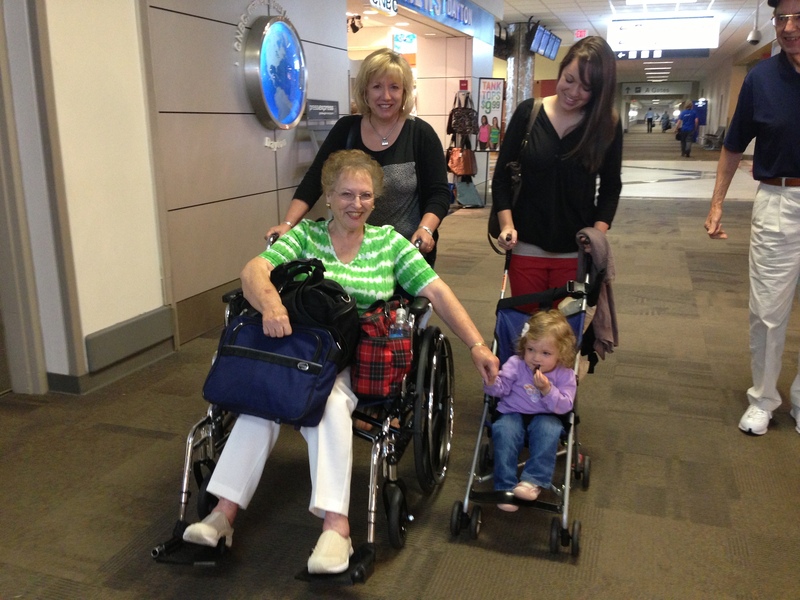 I absolutely love this photo of Audrey traveling last summer with her Great-Grandmother, Nonna, and Aunt Tiffany! 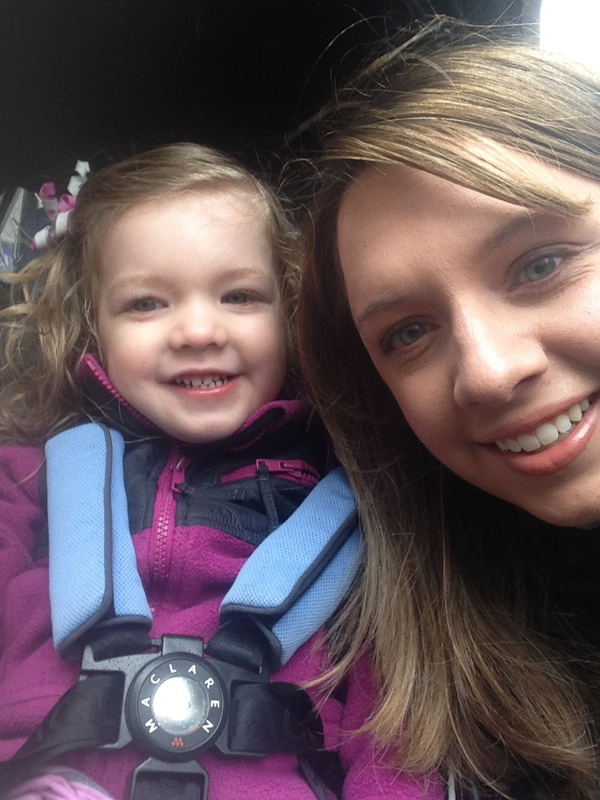 This past week was Alex’s spring break, so… we did potty training with Audrey! We introduced her new little potty on Saturday and she was SO excited to for “mommy and daddy to teach her how to go potty.” On Monday we took off the diaper, loaded her up on liquids (including apple juice, which was not much of a hit, and red gatorade which was a huge hit) and ending up spending most of the day reading books to her while she sat on her little potty. She loved sitting on it and getting to listen to books for hours. I handled training duties in the morning while Alex worked and then he took over for the afternoon so I could work on the paper for my Yalta course. Day two was about the same with about an equal number of successes and misses. And then day three… success!! No accidents and she initiated using her potty all by herself. Mommy and daddy were so proud! 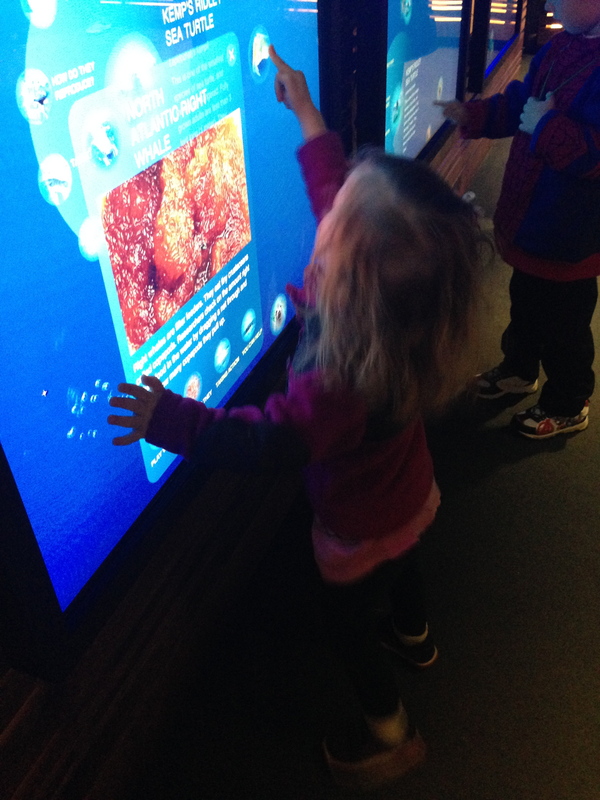 Today was our first big outing to a play place with some other Havard Law Review little ones and their families. And it was another big success. No accidents!! After those first two hard days, it was a remarkably easy process and we were so proud of Audrey!